The athlete above all others in the world I would choose as a role model for my children is Tim Tebow. From professional football idol making millions to a scrub player on a single A baseball team making very little, Tebow takes it all in stride. A fan at a game in New Jersey in which Tebow was playing noticed an incredible sight on the field directly in front of Tebow as his team was warming up. Appearing on the field in front of Tebow was the image (shadow) of a cross. Photo, below. After the game, Tebow took the time to explain his unshakable faith to reporters (:57 mark in the video, below). Tim Tebow’s professional baseball career has been filled with plenty of ups and downs. Even though his game has been a disappointment at times, he’s never let his fans down, reports The Wild Card. During a Columbia Fireflies vs. Lakewood BlueClaws match-up last year, a fan noticed a sight on the field so unusual that he just had to take a picture. 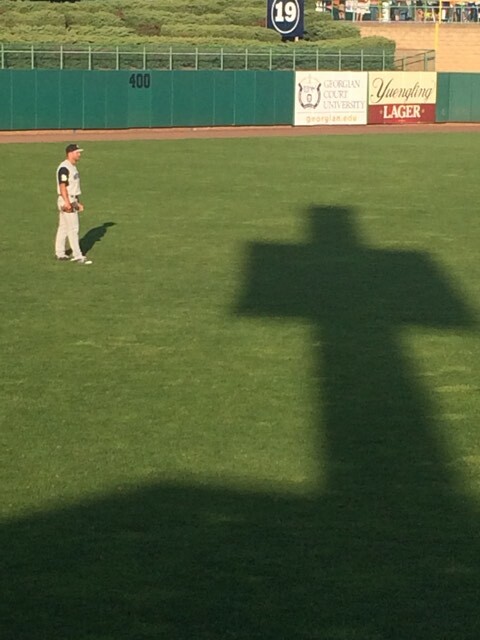 As the former Heisman-winning quarterback took his spot in left field and started to warm up, Mark Migliori, who was attending the game with his sons Gavin and Karsin, noticed a shadow in the shape of a cross appear on the field just in front of Tebow. “As Tebow took the field in left, I said to my son, ‘Do you see what I see?’” Migliori told The Wildcard. “Oh my gosh! The shadow appeared as he was warming up,” his son said. Migliori, who lives in Toms River, New Jersey, knew he had to go to the game when he heard Tebow would be coming to nearby Lakewood. “I’m a huge Tebow and Broncos fan and so are my boys,” he said. 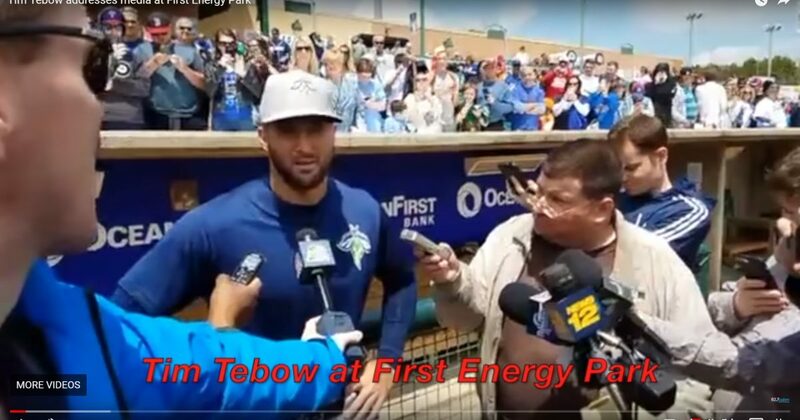 Whether this shadow was a coincidence or something more, Tim Tebow has undeniably made an impact on the world with his unflinching commitment to wearing his Christian faith on his sleeve. Last weekend, Tebow was asked about his faith by a reporter. “My faith is something that makes a difference in everything that I do — every single day, every choice that I make, every person that I meet, every action that I take,” he said. “It’s something that totally transforms your life in the way that you think and your perspective about everything,” Tebow added.